Now that we’ve established that you can make your career worth millions more if you manage it correctly, let’s discuss what steps you need to take to do this. Before we get into details, let’s discuss the one thing most people don’t do that’s costing them millions: they don’t manage their careers. Most people simply have a “take-it-as-it-comes” approach to their careers. They hope for the best, they want the best, they assume “if they do a good job” they will get the best. But they don’t take any steps to make their career (and thus their earning power) any greater. They have a “come-what-may” attitude to managing their careers and thus they get “come-what-may” raises, promotions, and the like (which, in case you are wondering, aren’t that great). On the other hand, there are people who actively manage their careers. They intentionally work on their careers, developing plans to grow and become better at their professions. As such, they get better-than-average promotions and better-than-average raises. And as such, they make millions more throughout their careers. A) Establish what the required output is for your position. B) Give your employer more than that. Those that consistently over-perform are the ones that get promotions, greater responsibility, and higher wages. And yes, there are skills you can develop that will make you more likable. We’ve all heard the phrase, “It’s not what you know, but who you know.” Knowing the right people isn’t the one end-all pathway to career success, but it’s a major part of it. You need to build and develop a broad network of people who can help you with your current assignments, point you to a new job if need be, serve as references during your job search, and be a resource for all sorts of career-related situations you may face. One key to having a great network is to be a helpful resource for others, so look for ways you can assist those in your network. And be sure to develop a networking plan centered around things like volunteering, attending local events, going to industry conferences, joining professional organizations, and the like to make sure your network is strong and healthy. Here’s what studies say about attractive people: “[They are] hired sooner, get promotions more quickly, and are paid more than their less-attractive coworkers. Attractive people earn an average of 3 or 4 percent more than people with below-average looks.” Another piece says beautiful people make 12% more than less appealing people. Fortunately (especially for me) you don’t have to go over-the-top and have plastic surgery to enhance your beauty. There are simple, basic steps everyone can take that will make them more attractive. Simply dressing nicely, having proper hygiene, being in shape, and so on are steps we can all take to improve our appearances. In addition, there are other qualities (higher self-esteem, pleasant personality (i.e. being likable), good social skills) that are generally attributed to attractive people that anyone can develop if they focus on them. 5. Continue learning and developing skills. If you want to continue showing value in your field, you need to keep learning and increasing your skills. Pursue certifications, degrees (especially those the company pays for), seminars, classes, training, and other opportunities that increase your expertise and ability to do a better job. Take time to learn through reading and listening to podcasts. Look (volunteer) for projects that help develop additional skills (leadership skills are especially valuable). Employers value these extras and you’ll eventually be able to cash in your hard work in one way or another. For more details see 7 Steps to Millions More: Continue Learning and Developing Skills. 6. Know how to manage yourself. Believe it or not, there’s a whole skill to managing your career that doesn’t involve the actual work itself. Some call it “office politics”, some call it “getting ahead”, and some call it “career planning”. I call it managing yourself. Whatever you may call it, to be successful you will need a certain amount of skill at reading the winds of changes and ebbs and flows in your company and its employees. Those that do well at this get ahead. Those that don’t often get left behind, and it’s not because the work they do is poor. Some questions we will answer in future posts: How do you promote your work without being over-bearing? How do you develop mutually beneficial relationships with key co-workers? How do you deal with the politics that exist at every workplace and come out ahead? To address these (and other) tasks successfully you need to know how to manage yourself. Believe me, there are a whole set of skills required here that have nothing to do with the job itself but everything to do with career success. 7. Know how to market yourself. At some point it’s highly likely that you’re going to have to find a new job. Do you have the skills to find new job opportunities, the know-how to get an interview, the ability to sell yourself and get a job offer, and the knowledge to negotiate the best possible deal for yourself? Top earners do. And they use these skills to grow their careers and salaries when needed. That’s my list for the most important steps in growing your career. I’ll elaborate on each of these in upcoming posts, but for now these should give you plenty to consider. Thanks for the post. Much needed one for all working folks. Like how you plan to elaborate on “managing yourself”, would also appreciate if you have some future posts on “marketing yourself”. If you have any tip and any external work you do to get the name out etc. I’ll be posting a series that takes each of the seven items above and breaks them down in detail. Stay tuned! ESI, where were you when i was working? lol. There is so much wisdom and the way you present the information. I am retired now, fortunately, but i can tell you i never maximized my decisions or managed my career very well. Fortunately, I excelled at my investing skills and that has largely offset bad career decisions plus allows me to live well in retirement w/o any need for W-2 income. And isn’t that what retirement is that you earnings from your non W-2 income exceeds what you need to live on. Sounds like you are now where most of us want to be. Here’s to the good life!! Your tips are very true and I am speaking from 20 years of work experience with the last 10 in very senior and highly compensated roles. You mentioned this in your first point but I would re-emphasize the importance of correctly managing upwards while still being a team player. It’s part art and part science as it varies with the culture of the organization. The best chance for a salary jump is when changing companies. The second best opportunity for this is by managing upwards effectively, especially as your compensation becomes very ‘rich’ within the overall market. I Look forward to reading more on career managing. I’m at a difficult point in my life and boy do I need help. Thanks. For the last 5 years, I have been in the same role in the same company. I am looking for opportunities elsewhere as I feel the work has been stagnant. Is it too late to over perform in my current role? Or am I better off to start fresh at a different job, if I can get one…. Do you feel like you’ve already over-performed and haven’t been recognized? Or do you think you’ve just done “ok” and that’s why you’re stuck? There could be tons of other reasons why you haven’t gotten promoted (like the company is too small or is struggling.) It’s going to be hard to give you advice with so little information. If you want to write up the details of your situation and email it to me, I’ll post it here and have ESI readers give you some feedback. I know there are many successful executives who read this blog and I’m sure they’d help you out. I agree with what ESI says and of course I have different insights. Two of the advantages to over performing now is that 1) you increase your chances of being recognized now and 2) you get to “practice” over performance now so that you are better at it sooner. 1) There is a very good chance that if you over perform now that you will relight the fire inside you that you once had for your current job. The more excitement that you feel towards a job, the better that you do on a daily basis. You can still look for opportunities elsewhere, you should always be doing a job search, but by over performing now, you will also create opportunities where you currently work. Besides, you may have more fun at work, which is always desired. 2) By over performing now, you will also get to learn how to over perform. “Practice makes perfect.” Just working too many hours with no plan or logic is a waste of time. You need to pick and choose your actions so they lead you to the successes that you desire. The sooner you start making these choices, the sooner you will get good at it. Over performing properly is a skill that needs to be developed. Like all skills, people are great at ones and stinky at others, and everybody is different. Great content. I heard of over-performing before. Basically, make yourself indispensable and you are likely to stay employed and get raises. I share what I have learned about building wealth on my financial freedom blog greenbacksmagnet.com. Thanks again for this post. I will put this knowledge to use. I have always valued “continued learning and developing skills.” My fiancee and I actually are currently in a Coding Boot Camp that will allow the both of us to transition into software developer/engineer fields, so that we are better prepared for the future work force. I am not sure I fit the “attraction” scenario. But hey, at least my fiancee likes me right…??? Managing yourself and putting the money into stocks are the two things that I personally live by. For example, I knew at the start itself that cryptocurrency was volatile, so I only spare small amounts for that. Which helped me in the long-run. Not being impulsive with your purchases definitely helps. Do you think paying monthly rent is better than owning a house? Think about the latter as an investment and it makes more sense. Networking is the key to long term success. It’s only through knowing other people that you open yourself up to new opportunities and ideas so get out there and meet more people! I am currently going through a career change from teaching to accounting. I think there can be a lot said for leaning your career ladder up against the right wall. My first degree was in electronics engineering and when I switched over to teaching, it wasn’t a huge difference in pay, but as my college friends have gotten more senior positions most are making 2-6 times as much as me. 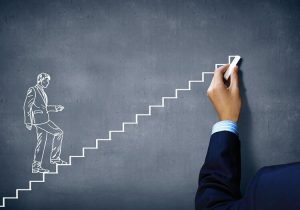 Certain career paths have much more limited upward growth no matter how well you apply the 7 steps. Although, I suppose that you could say I am developing my skills to move my ladder to a better wall, so I guess it still applies. Thoughts? There’s no doubt that some professions make more than others. So if you like the work required in a high-paying field, why not go for it? That said, whatever field you are in, you can make more than you would otherwise if you apply the steps above. Plus you could always pivot a bit. For instance, it’s common for engineers to start high, but make slower gains compared to others. But many engineers I’ve known went back to school, got an MBA, and are now managers of engineers making much more. These are so valuable and I particularly love the one of knowing how to manage yourself. For me I’ve gotten better at this I’ve worked continuously on my personal self-improvement in sobriety. Everything spills out into everything else. As I got healthier in my personal life, my professional life has gotten healthier & wealthier. I think I need to binge ALL of your career articles. Your advice is golden. Agree with this list! I like the honesty of it as well. Overperfom and be likeable. As a leader of a large team these are very important for me I don’t want a lot of drama but do try to have a personal connection with my team. Don’t create drama! Be positive, negativity is contagious. You don’t need to be a yes man and you don’t need to assimilate to every norm but focusing on your company’s culture and embracing it will go a long way. That is why for me it’s so important to learn as much as possible about the culture before joining.